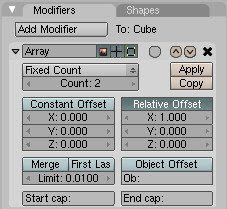 Another very cool feature in Blender 3d is the array modifier. 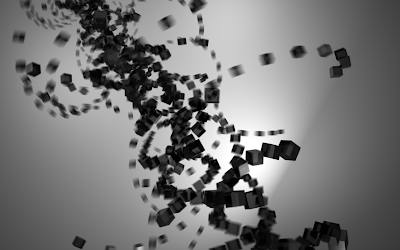 It can create really nice "abstract" animations and random stuff like the whirl of cubes below. You can also check out some other examples at Blender's array page. The main reason for this tutorial is to help people who have difficulties going pass the point of simply creating rows of duplicates. There're some video tutorials out there that teaches how to do so, but videos tutorials often load sluggishly and sometimes hang before even getting to the point. 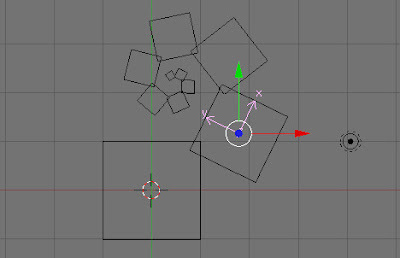 Blender 3d array rotation. Array modifier. 3d Blender Array Tutorial. 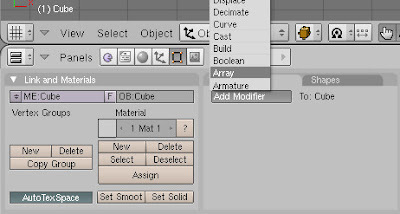 This tutorial is on how to use arrays in Blender 3d. It show you how to rotate, offset, in arrays. Also, it is a Blender 3d double helix tutorial on how to make blender 3d dna be spinning the mesh using rotation and spirals. In case if you are totally new to the array function, fret not. To use it, simply click on the object you want to use arrays on, then go to "Editing" (Press F9). Under "Modifiers", click on "Add Modifiers" and click on "Array". Here's the main point. To perform tricks such as rotation, spirals, etc, you must make use of the "Obj. Offset" function. But firstly, we have to make a reference object for the "Obj. Offset" to work. In the 3d view, insert an Empty ("Press Space" -> "Add" -> "Empty"). Select the original object in 3d view it again. Under the "Obj. Offset" text field, type in "Empty". 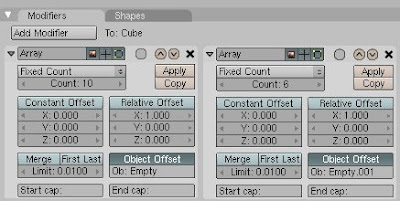 Next, deselect the "Relative Offset", as the Obj. Offset can cover its function. You may want to bump up the Count so that the array effects are more apparent later. Lastly, select the Empty in the 3d view. (It is denoted by the x-y arrows, not the colored ones) Try dragging it around, rotating it, resizing it, and watch the array morph into funky new patterns! You can add another array modifier to make an array of an array. 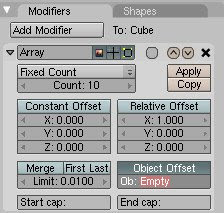 (a.k.a 2d array) For the 2nd array modifier, you need another Empty, and it should be called Empty.001 by default. So, why not use the power of the subconscious to control others? Imagine making people do your bidding without the slightest disagreement. Imagine using it to control the whole internet! Muahahaha! Unlike static pictures which requires careful photo manipulation to plant those messages in, it is much simpler for an animation. The trick is to make the animation play at a very high frame rate (eg. 30 frames per second), and place the subliminal message on a unsuspecting frame. The average human eye is known to see 25 frames per second. But actually, it records at a much higher frame rate, but much of the visual data is passed on to the subconscious. This method has been tired and proven in some lipton ice tea ads. 1. 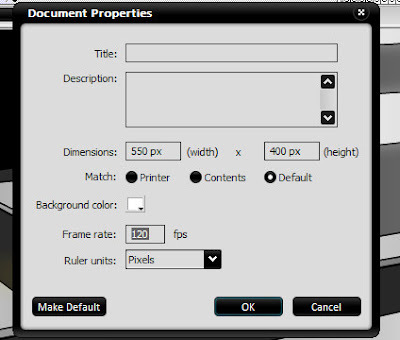 With your flash animation open, right click anywhere on the stage, go to "Document Properties"
3. Divide 120 with your frame rate. Then, drag all the keyframes in your timeline to be this many times apart, so that the animation still plays at normal speed. 4. Choose the keyframe where you want to put your sublimimal message in, then enter the text. Use Transitions to Disguise the Message, if Possible. You don't want your audience to see it easily, or who knows there might be an angry mob flaming you to the depths of internet hell. But luckily, the average human doesn't really focus on transitions. (eg. swipe, dissolve, fade, those powerpoint like stuff) This is a good way to get the message hidden better, while not sacrificing on its effectiveness. Do Not Over-distort The Subliminal Message. Distorting the image is good if you are worried that the viewer may spot it. But, there are limits to distorting the message. If the image is too distorted, the mind may not work out what it is, even if the power of the subconscious is used. A gauge you can use is to make sure you can work out the message without thinking staring too hard at the frame it is on. A Single Message Works Best. The human brain remembers an idea best if it stands alone. I suppose you can actually put two or more if the animation is long enough. This is to give the mind some time to register each message. In case you are wondering, the message in the flash banner above is "BeHappy".